By g-stock 2011/07/07 1,523 commentsスタッフのBlog, 英語で何ていうの? by the milky way but once a year they can reunite on 7/7. 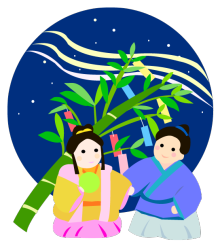 Today is Tanabata (7/7) or Star Festival in English. but once a year they can reunite on 7/7. People write their wishes and hopes on paper and hang them on bamboo.